Therese Patricia Okoumou, the soul sister who defiantly sat at the base of Lady Liberty to protest of Trump’s inhumane immigration policies, spoke out for the first time and credited our Forever First Lady Michelle Obama as the inspiration for her Statue of Liberty sit-in. “Michelle Obama … said when they go low, we go high. And I went as high as I could,” Okoumou said. The heroic Black woman, who is an immigrant herself, rose up in resistance and climbed the Statue of Liberty on the Fourth of July. The 44-year-year old was arrested and charged with trespassing, interference with government agency functions, and disorderly conduct, reports ABC7. When she emerged from the court, crowds awaited her and cheered for Okoumou. Okoumou, emigrated from the Democratic Republic of Congo in 1994. “(This) alarmed the public and endangered her own life and the lives of the NYPD officers who responded to the scene,” U.S. Attorney Geoffrey S. Berman said. “Let’s gets some nets, and let’s wait till she comes down,” Trump said. Earlier this week Okoumou’s group waved an “Abolish ICE” banner at the bottom of the Statue but members of the group said no one knew of her intentions. Okoumou was obviously tired of being tired as she waved a “Rise and Resist” tee as well as a “Trumpcare Makes Us Sick,” shirt. 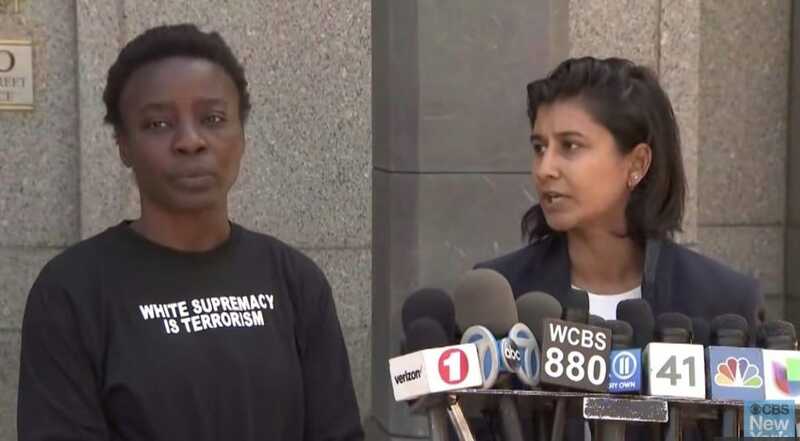 Okoumou is expected back in court August 3 for a status conference. She faces a maximum penalty of six months in prison and a fine.